Ickle Pickles Charity Fund Raising Event! Ickle Pickles are the smallest and sickest babies who need intensive care in Neonatal Units – whether they are born too soon or with an illness. The NHS cares for over 20,000 Ickle Pickles every year and the Ickle Pickle Partnership turns gifts and donations from generous people into specialised equipment such as incubators and ventilators to help Neonatal units provide incredible levels of care for Ickle Pickles. Advances in Neonatal medicine have created incredible improvements in survival rates. In 1975, half of all babies born weighing less than 1.5kg (3.3 lbs) died. Compared to today’s figure where over 90% of premature babies weighing 800g or more (equivalent to a bag of sugar) survive. The charity was established in April 2009 following the premature birth of Charlie at 28 weeks in March 2008. He spent 3 months in the Neonatal Unit (NNU or SCBU, Special Care Baby Unit) and today is a healthy and happy little boy who charms everyone he meets. Ickle Pickles decided to raise some money for the NNU where Charlie was treated but found that there wasn't a charity they could raise the funds through. So they decided to set up a charity that could channel funds raised by parents and families of 'Ickle Pickles' directly to the NNU as intended. Their strategy is to build a team of volunteers within the local area to help organise events, contact local businesses for sponsorship and raise much needed funds. The activities for each NNU would be managed by an 'Ambassador' - someone who knows the local area and can liaise with the team centrally on a regular basis. Besides their own appeals, Ickle Pickles also enables parents and families to run their own localised appeals for the specific Neonatal unit that helped their Ickle Pickle and together they can make a big difference. To date Ickle Pickles have hosted a number of events, from Black tie Balls to wine tasting evenings and summer fete's in the park. Their most recent fund raiser event is going to take place at the Pyramids Shopping Centre in Birkenhead on the 6th December starting at 9am. There will be lots going on including tombola prizes to be won, cake sales, merchandise and the spectacular, adrenaline pumped main event! Don’t miss two brave teams of men and women team take on the Mount Everest challenge! The men’s team will be climbing the equivalent height of Mount Everest which is an immense 8991.6 metres and the ladies team will be rowing the circumference of Mount Everest which is an enormous 80,000 metres!! 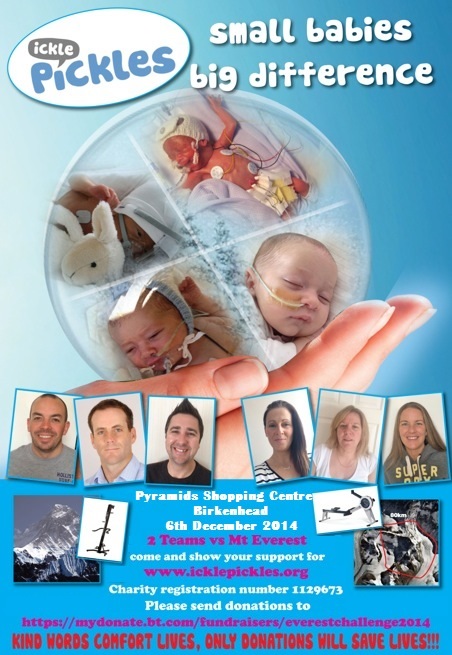 So don’t miss out on this fantastic event where donations will help tiny babies survive thanks to the care of Neonatal Units! Ickle Pickles have an account on Just Giving and BT My Donate so if you are planning to take part in a challenge you can easily set up a page dedicated to your local unit through us - this guarantees that the funds are directed to the NNU and not elsewhere within the Trust. Once funds are raised, Ickle Pickles liaise directly with the NNU to discuss the amount to be donated and their 'Wish List'. Then they discuss it with you, present the funds in the form of a Restricted Grant (this ensures the correct equipment is purchased with your funds) and organise a plaque to be mounted with our logo and a message from you. Ickle Pickles have raised over £950,000 to date and have donated equipment to NNU's in London, Tunbridge Wells, Worthing, Sheffield, Nottingham, Birmingham, Leeds, Ormskirk, Barnsley and Portsmouth. They are keen to develop relationships with these and many other units, supporting them on a local basis. Ickle Pickles are also working closely with the London Neonatal Transport Service (LNTS) who are responsible for transporting 1500 sick & premature babies across the capital each year. £1200 from corporate sponsors including Pali Ltd and £1000 from public donations. Purchase specialised equipment, such as incubators and ventilators, to help Neonatal units provide incredible levels of care to premature and sick babies. Assist Neonatal Units to improve their facilities, so parents, families and friends of babies in Neonatal care can experience a welcoming and homely environment. Provide a channel for families and friends of babies treated in Neonatal units to raise funds for NNU / NHS Trusts around the UK. Raise awareness amongst the British public about Neonatal care and the continuous requirement for blood and platelet donation. Please click HERE if you wish to donate to this charity which helps premature babies survive.